Overall survival (P = .23). Disease-free survival (P = .14). Hypothesis Laparoscopic hepatectomy and open hepatectomy for hepatocellular carcinoma (HCC) have the same surgical outcome. Patients Twenty-five consecutive patients with HCC undergoing laparoscopic hepatectomy from January 1, 1998, through December 31, 2007, and a retrospective control group of 33 patients who underwent open hepatectomy for HCC during the same period. The 2 groups were matched in terms of demographic data, tumor size, and severity of cirrhosis. 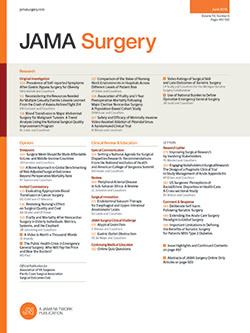 Main Outcome Measures Surgical morbidity rate, mortality rate, and survival. Results One patient in the laparoscopic group underwent conversion to an open approach. The median operating time and blood loss were 150 minutes and 200 mL, respectively. The resections were R0 in 22 patients (88%) and R1 in 3 (12%). The hospital mortality and morbidity rates were 0% and 16% (4 patients), respectively. The 3-year overall and disease-free survival rates were 60% and 52%, respectively. There was no difference in surgical morbidity rate, hospital mortality rate, and midterm survival results between the 2 groups. The laparoscopic approach resulted in a shorter hospital stay. Conclusions Laparoscopic hepatectomy for HCC is feasible and safe in selected patients. Midterm survival is also favorable. The laparoscopic approach has the benefit of a shorter hospital stay. However, the procedure should be performed by a surgical team expert in hepatobiliary and laparoscopic surgery in properly selected patients. Hepatocellular carcinoma (HCC) is the fifth most common cancer in the world. It accounts for 5.6% of all human cancers.1,2 The number of new cases is estimated to be 500 000 to 1 million per year.1,2 Eighty percent to 90% of HCC develops in cirrhotic liver.1-3 Potentially curative treatments for HCC include liver resection, liver transplantation, and local ablative therapy.4-6 Among these, liver resection is regarded as a standard treatment that offers a chance of cure for patients with preserved liver function.7-9 The development of minimally invasive surgery during the past 2 decades has had a substantial effect on surgical practice in the world. Laparoscopic liver resection has also become possible with the availability of new instruments that allow a relatively bloodless liver transection. The advantages of laparoscopic liver resection are those of minimally invasive surgery in general, such as early recovery, shorter hospital stay, and better cosmetic outcome. The postoperative course after laparoscopic liver resection may also be improved in patients with cirrhosis because the abdominal wall is preserved, kinetics of the diaphragm are improved, collateral venous drainage is better, and there is less postoperative ascites. Currently, the laparoscopic approach is used mainly for minor hepatic resections, wedge resections, segmentectomy, and bisegmentectomy.10-16 Laparoscopic liver resection of HCC is still a matter of debate because of the uncertainty of the midterm and long-term results and the fear of compromising the oncologic resection.12 Available data about laparoscopic liver resection for HCC and published data from the follow-up evaluation in the literature are still limited. The aim of the present study was to study the feasibility, safety, and midterm results of laparoscopic liver resection of HCC. A prospective data collection of laparoscopic liver resection was initiated in our surgical center in 1998. The study population was a consecutive series of patients with HCC who underwent laparoscopic liver resection in a tertiary referral center. All patients underwent chest radiography, ultrasonography of the abdomen, and contrast computed tomography of the abdomen. A computed tomographic scan with lipiodol contrast was performed in selected patients. Laboratory blood tests including hepatitis B surface antigen, antibodies to hepatitis C, serum α-fetoprotein (AFP), serum albumin, serum total bilirubin, aspartate aminotransferase, alanine aminotransferase, and prothrombin time were performed and the Pugh modification of the Child classification was determined. Further investigations were performed only when there was clinical suspicion of extrahepatic metastases. Radiologic studies were reviewed in a multidisciplinary case management meeting held weekly. We mainly selected patients with normal livers or Child class A cirrhosis, tumor size of 5 cm or less, and tumor location at the anteroinferolateral segments (Couinaud segments 2, 3, 4b, 5, and 6) for laparoscopic resection. Solitary exophytic tumors larger than 5 cm that were accessible by the laparoscopic approach were also considered. All procedures were performed by consultant surgeons with expertise in hepatobiliary and laparoscopic surgery after informed consent was obtained. After surgery, all patients were followed up with serial AFP assay, and ultrasonography or computed tomography of the abdomen was performed every 3 to 6 months. Prospectively collected data, including intraoperative factors, postoperative complications, hospital mortality, and disease progress, for laparoscopic liver resection were analyzed. We also selected all patients in our computer database, matched with the laparoscopic group for demographic data, tumor size, severity of cirrhosis, and surgical procedure, who underwent open liver resection for HCC during the same period. These patients in the open liver resection group were retrospectively compared with those in the laparoscopic liver resection group with respect to operation time, hospital stay, surgical morbidity rate, hospital mortality rate, and survival rate. The patient was placed in the Lloyd-Davis position. The chief surgeon operated between the patient's legs with assistants on each side. Preoperative laparoscopic staging was performed first before liver resection. A subumbilical open technique was used to insert a 10-mm port, and pneumoperitoneum was established with carbon dioxide insufflation to a maximum pressure of 12 mm Hg. With a 30° laparoscope, the liver surface, porta hepatis, and peritoneal surface were inspected. A second access port was inserted in the right upper quadrant at the midclavicular line under video guidance. The flexible laparoscopic ultrasonography probe (7.5 MHz; Aloka, Wallingford, Connecticut) was inserted through this port and placed in contact with the liver and the porta hepatis. After preoperative staging and assessment of liver functional reserve, the plane of transection could be easily determined. The planned transection plane was marked on the liver surface by diathermy. Total laparoscopic liver resection was adopted for small lesions (<2 cm in diameter). For larger lesions, hand-assisted laparoscopic liver resection was used. Four to 6 working ports were used. The position of the laparoscopic system (GelPort; Applied Medical Resources Corp, Rancho Santa Margarita, California) was governed by the position of the patient and the type of liver resection (Figure 1). A 7-cm-long transverse incision (based on the palm size of the operating surgeon) was made at the right side of the abdomen, slightly above the level of the umbilicus. The incision was not placed directly over the diseased area or too close to the laparoscope so as not to limit the view or the range of movement of the instruments. For patients with good liver functional reserve, the Pringle maneuver was used to apply intermittent vascular control to reduce blood loss. To accomplish this, the avascular lesser omentum was divided and a vascular sling was passed around the hepatoduodenal ligament. If vascular control was required, the tension could be tightened and retained as needed by an artery forceps. The ligaments attaching the liver were divided, for example, left triangular ligament for left lateral sectionectomy and right triangular ligament for right liver disease. The falciform ligament was routinely transected with the aid of a tissue fusion system (LigaSure; Valleylab, Boulder, Colorado) and the stump was grasped for retraction. After these preliminary steps, and provided the central venous pressure was optimal (<5 cm water), parenchymal resection was carried out with an ultrasonically activated cutting and coagulating instrument (UltraCision Harmonic Scalpel; Ethicon, Cincinnati, Ohio) and an ultrasonic surgical aspirator (Sonopet UST2000; M&M Co Ltd, Tokyo, Japan). Application of either a titanium clip or an endostapler (2.5/60, Autosuture; United States Surgical Corp, Norwalk, Connecticut) was used for the main vascular branches and bile ducts. At the completion of the parenchymal transection, the raw surface was inspected for any bile leak or oozing, and such areas were plicated with 2/0 polypropylene. An argon beam was also used to achieve more complete hemostasis from any raw and oozing surface. Tissue glue (Tisseel Kit; Immuno AG, Vienna, Austria) was also sprayed over the raw resection surface to improve hemostasis and prevent bile leak. All specimens were delivered inside a protective bag. Continuous variables were expressed as median (range) and were compared by means of the Mann-Whitney test. Categorical variables were compared by the χ2 test or Fisher exact test. Survival and recurrence-free survival were measured from the date of operation to the time of death and to the time when a recurrent tumor was first diagnosed, respectively. Survival analysis was estimated by the Kaplan-Meier survival method, and the differences in survival between the groups were compared by the log-rank test. P < .05 was considered statistically significant. From January 1, 1998, through December 31, 2007, a total of 25 patients with HCC underwent laparoscopic liver resection in our surgical unit. This represented 20% of all liver resection for HCC during this period. The demographic data and preoperative status of the 25 patients are shown in Table 1. These 25 resections were performed on 18 men and 7 women with a median age of 59 years (range, 35-79 years). According to the American Society of Anesthesiologists physical status classification, 24 patients were class II and 1 patient was class III. Surgical procedures and details are shown in Table 1. The median operation time was 150 minutes (range, 75-210 minutes). The median blood loss during surgery was 200 mL (range, 5-2000 mL). Only 2 patients (8%) needed postoperative blood transfusions. The only conversion (4%) was because of injury to the left hepatic vein, which resulted in moderate bleeding, and the patient underwent immediate open laparotomy and liver resection. Pathology results are shown in Table 2. Of the 25 patients, 22 (88%) had R0 resection and 3 (12%) had R1 resection. The median hospital stay was 7 days (range, 4-11 days) (Table 3). There was no in-hospital death after operation. Postoperative complications consisted of acute pulmonary edema (n = 1) and wound infection (n = 3). None of the patients developed liver failure or encephalopathy. Only transient elevated bilirubin and liver enzyme levels were encountered. Bilirubin concentrations and liver enzyme values returned to preoperative levels in 15 patients (60%) within 7 days and in all patients by 14 days after operation. One patient was found to have an incisional hernia at the port site during follow-up. Thirteen of the 25 patients (52%) had elevated AFP levels preoperatively. After laparoscopic liver resection, AFP level returned to normal in 11 of these 13 patients (85%) during follow-up. After a mean follow-up of 29 months (range, 3-110 months), 9 of the 25 patients (36%) developed disease recurrence (isolated hepatic recurrence, n = 6; hepatic recurrence and distant metastases, n = 2; and distant metastases only, n = 1). No patients developed tumor recurrence at the site of resection. No port site or peritoneal metastases were observed in any patient. The median time to recurrence was 8 months (range, 3-27 months). All 9 patients with recurrence died. Among the 6 patients with isolated hepatic recurrence, 4 had bilobar multifocal recurrence and 2 had local recurrence over the left side of the liver. All of these 6 patients were treated with transarterial chemoembolization. The 2 patients with left-sided liver recurrence were not candidates for liver transplantation because 1 patient was still a heavy drinker of alcohol at the time of recurrence and the other patient had a large tumor recurrence, which was outside of the Milan criteria. Both of them also had insufficient liver reserve for another liver resection at the time of recurrence. Of the other 2 patients with combined hepatic recurrence and distant metastases, 1 was treated with systemic chemotherapy and the other was treated with external radiotherapy for bone metastases. The 3-year overall and disease-free survival rates were 60% and 52%, respectively (Figure 2 and Figure 3, respectively). During the same study period, a control group of 33 patients underwent open liver resection (wedge liver resection, n = 13; segmentectomy, n = 18; left lateral sectionectomy, n = 2) for HCC. The 2 groups were matched in terms of demographic data, tumor size, severity of cirrhosis, and surgical procedure. As shown in Table 3, no differences in operation time, postoperative complication rate, and hospital mortality rate were found between the 2 groups. The postoperative hospital stay for the laparoscopic group was significantly shorter than for the open group (median, 7 days vs 9 days). There were no significant differences between procedures with regard to overall and disease-free survival rate (Figures 2 and 3, respectively). To our knowledge, this study is the third-largest series of laparoscopic resection for HCC with midterm survival outcome reported in the medical literature. Cherqui et al15 reported on a cohort of 27 patients with HCC who underwent laparoscopic liver resection. Seven conversions to laparotomy (26%) occurred because of moderate hemorrhage in 5 cases and technical difficulties in 2 cases. Median hospital stay was 15.2 days. Mortality and morbidity rates were 0% and 33%, respectively. After a mean follow-up of 2 years, 8 patients (30%) developed intrahepatic tumor recurrence, of which 1 died. The 3-year overall and disease-free survival rates were 93% and 64%, respectively. Recently, Dagher et al16 reported on a cohort of 32 patients with HCC who underwent laparoscopic liver resection. Conversion to laparotomy was required in 3 patients (9%). Mean hospital stay was 7.1 days. After a mean follow-up of 26 months, 10 patients (31%) developed intrahepatic tumor recurrence. The 3-year overall and disease-free survival rates were 72% and 55%, respectively. In our series, similar favorable results were found. The hospital mortality and morbidity rates were 0% and 16%, respectively. The conversion rate was only 4%. After a mean follow-up of 29 months, 24% of patients experienced isolated hepatic recurrence. There was no port-site recurrence during follow-up. The 3-year overall and disease-free survival rates were 60% and 52%, respectively. Up to now, there has been no randomized controlled study directly comparing laparoscopic liver resection and open liver resection for patients with HCC, although 4 nonrandomized comparative trials compared the 2 techniques.17-20 Two studies showed better survival results in the laparoscopic group,17,20 whereas the other 2 studies showed no significant difference in survival results.18,19 Our study showed no significant difference in either disease-free or overall survival between laparoscopic and open laparoscopic liver resection for HCC. In our series, 3 patients had R1 resection. Two tumors were located in segment 6 and 1 tumor was located in segment 4. At the time of censor, only 1 patient had had local tumor recurrence, which was remote from the resection site. Two R1 resections were performed because of involvement of surgical margins by small satellite daughter tumor nodules, which had not been detected by preoperative imaging and intraoperative ultrasonography. This could not have been avoided even with the open approach. In conclusion, laparoscopic liver resection of HCC is feasible, with an acceptable complication rate, in selected patients. The midterm survival is also favorable and comparable to that of the open approach. However, the procedure should be performed by a surgical team expert in hepatobiliary and laparoscopic surgery in properly selected patients. These favorable findings in laparoscopic resection for HCC need further investigation and, because of the small number of suitable patients with HCC for laparoscopic liver resection in each center, multicenter studies are probably needed. Correspondence: Eric C. H. Lai, MB ChB, MRCSEd, FRACS, Department of Surgery, Pamela Youde Nethersole Eastern Hospital, 3 Lok Man Rd, Chai Wan, Hong Kong SAR, China (ericlai@alumni.cuhk.edu.hk). Accepted for Publication: January 22, 2008. Author Contributions:Study concept and design: Lai, Tang, Ha, and Li. Acquisition of data: Lai. Analysis and interpretation of data: Lai. Drafting of the manuscript: Lai. Critical revision of the manuscript for important intellectual content: Lai, Tang, Ha, and Li. Statistical analysis: Lai. Obtained funding: not applicable. Administrative, technical, and material support: Tang and Li. Study supervision: Tang, Ha, and Li.